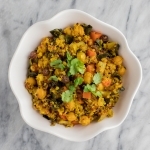 A delicious, plant-based chickpea quinoa dish that is packed with nutritional benefits and flavorful, anti-inflammatory spices. It’s a great weeknight dinner that makes an easy-to-pack lunch for tomorrow. Warm olive oil in a Dutch oven (or a deep saucepan with lid) over medium heat until shimmering. Add the onion, carrot, optional pinches salt and cook, stirring frequently, for 8 to 10 minutes or until the veggies have softened. Meanwhile, prepare the remaining ingredients. Stir in the garlic, ginger, turmeric, curry powder, salt and cook until fragrant, about 1 minute. Next, add the rinsed quinoa and cook, stirring often, for 4 to 5 minutes. Remove from heat. Season with black pepper and squeeze the juice of half a lemon into the mixture. Stir to combine and adjust seasonings as needed. Serve warm. Store leftovers in an airtight container for 3 to 4 days in the fridge. How to Rinse Quinoa: In a small-holed colander (or fine mesh strainer), rinse the quinoa under running cold water for 1 to 2 minutes to remove its bitter tasting coating known as saponin. Lacinato Kale Substitutes: Curly kale, Redbor kale (purple-reddish colored) or baby spinach can replace the Lacinato kale with a minor cooking adjustment. If using curly or Redbor kale, add to the chickpea quinoa mixture in the final 10 to 12 minutes of cook time. Baby spinach should be added in the final 5 to 7 minutes. Don’t forget to return the cover once the greens are added. How to De-Stem Kale: Start with pre-washed and towel dried kale leaves. De-stem kale leaves by cutting along the sides of the tough stem. Discard stems. Stack kale leaves on top of one another and roll from one end to the other. Using a chef’s knife, slice crosswise through the roll, creating 1/2″ wide strips. Gather strips and chop into bite sized pieces.